Very nice! i love the colors of him! Thats a pretty sweet looking mojave! Thanks! We think he's pretty darn handsome Can't wait for him to settle in so we can do a sunlight photo-shoot! I like the yellow in him! Is it possible he might have chocolate in him?? The tiny dots within the alien heads, and the crazy spacing between 'em are very unique and cool! I don't believe so, but I'm sure stranger things have happened. Dad was a Mojo mom was a normal. 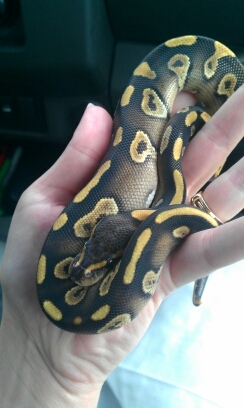 I saw a pic of mom and she is a nice gold, reduced pattern with great flames. Dad was still dark ask adult with nice contrast (best as I could see anyways, it was outside during the day looking at a camera screen lol) He was reduced a bit. Not as much as our boy, but still a handsome fella. Who knows though He'll have my pastel lesser for a girlfriend in a few years, and before that we might grab a normal or two for him in the next year. Only time will tell! Oh wow he is very cool! His pattern is so reduced!